Santa Rosa, Calif. � Think Tank Photo has just �released a new camera bag collection scaled to fit today's smaller mirrorless cameras, the Mirrorless Mover�.� The Mirrorless Mover collection offers photographers the same top quality materials and craftsmanship for which Think Tank is renowned. "Unlike many other bags in this class, our Mirrorless Mover collection does not cut corners in materials or craftsmanship," said Doug Murdoch, Think Tank Photo's president and lead designer. 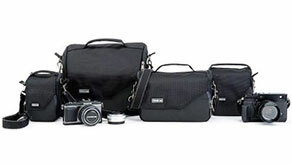 �"We utilize metal hardware instead of plastic buckles, high quality fabrics, YKK zippers and a new, magnetic closure.� The Mirrorless Movers offer photographers quality in their camera bags worthy of their investment in these sophisticated, expensive camera systems." The Mirrorless Mover 5 fits one small size mirrorless body with a small telephoto or pancake lens attached. It is sized for the Canon EOS�M, Leica D�Lux, Nikon 1 series, Olympus E�PM2, E�PL5, EP�3, Panasonic GF3, Sony NEX�C3, or similar sized bodies. The Mirrorless Mover 10 fits one medium size mirrorless body plus one to two lenses and additional accessories. It is sized for the Leica V�Lux, Olympus OM�D E�M5, Panasonic G3, GF5, GH2, Samsung NX5, NX11, NX210, Sony NEX�5, NEX�6, NEX�7, or similar sized/smaller bodies. The Mirrorless Mover 20 fits one medium size mirrorless body plus two to three lenses and additional accessories. It is sized for the Leica V�Lux, Olympus OM�D E�M5, Panasonic G3, GF5, GH2, Samsung NX5, NX11, NX210, Sony NEX�5, NEX�6, NEX�7, or similar sized/smaller bodies. The Mirrorless Mover 30i fits one medium to large size mirrorless body plus two to four lenses, iPad, and additional accessories or a small�size DSLR and one to three small telephoto lenses or primes. It is sized for the Fuji X�Pro 1, Leica M8, Panasonic GH3 or similar sized/smaller bodies. Small DSLRs: Canon Rebel, Nikon D3200/D5200, Sony SLT�A55/A37 or similar sized bodies. Designed specifically for mirrorless equipment. High quality YKK zippers and metal hardware. Multipurpose divider with smart phone slot and two SD card slots (excluding smallest size). Dedicated iPad pocket (Mirrorless Mover 30i). Easily accessible front organizer pocket. Stretchable side pockets fit accessories. Padded non-slip flexible shoulder strap (Mirrorless Mover 30i). Seam�sealed rain cover included in front pocket. Internal mesh pocket on lid for batteries or other accessories. Exterior: All fabric exterior treated with a DWR coating while fabric underside is coated with PU for superior water resistance, YKK� RC zippers, 1680D ballistic polyester, 600D brushed polyester, Ultra-stretch pocket, antique nickel plated metal hardware, 3-ply bonded nylon thread. Think Tank Photo is a group of designers and professional photographers focused on studying how photographers work, and developing inventive new carrying solutions to meet their needs. By focusing on "speed" and "accessibility," we prepare photographers to Be Ready "Before The Moment," allowing them to document those historic moments that reflect their personal visions and artistic talents. We design products that help photographers travel easier, take pictures faster, and organize their gear more efficiently.